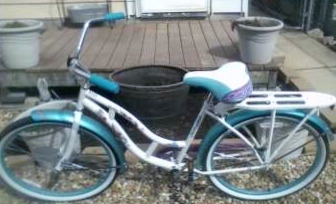 I have been really busy this week catching up on my other social media, advertising, shipping, emails, and other fun work related things, so today my husband took me out for coffee and then took me to Walmart to pick up this, a Schwinn Delmar 26″ Ladies Cruiser Bike! Needless to say, I was extremely excited! The last time I owned a bike was over 12 years ago and was given to me by a friend while I was in college. Some idiots on campus stole it one night, took it for a joyride and bent the frame to the point that it wasn’t usable. While, I have an awesome exercise bike, I have always wanted a regular bike to ride around with the children and enjoy on the bike trails south of where I live. Of course, in my excitement, I had my husband drop me off out in the country on the way home and rode it back to the house. Mind you, I was riding back against the wind, hadn’t been on a real bike in years, couldn’t breathe through my nose because of the cold, and had a seat that was a bit high. Also, I forgot to bring my phone with me and realized it as my husband drove away. Yeah, it probably wasn’t the best decision I made, but I rode it home and am still excited to take it out with the kids! I absolutely love this bike. It handles nicely, and it is a comfortable ride. I had taken it over the railroad tracks, and I did not feel the bumps. I didn’t want something with a lot of bells and whistles, so this bike is perfect for me! So yeah, this is my hot new ride, and I am super excited for spring! What new adventures have you had lately?